The feeling of pure speed. 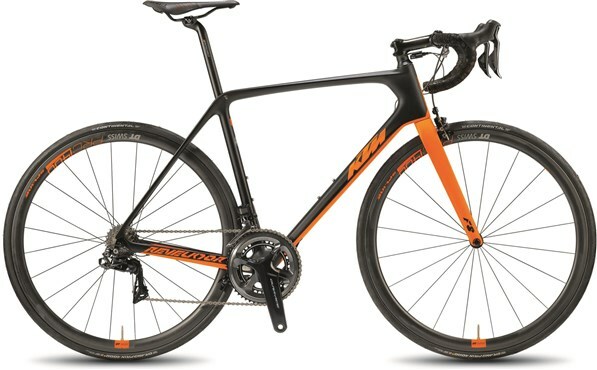 The Revelator Alto is KTM´s premium road bike range. It features frame style designed to meet the needs of the modern cyclist. The Alto Master also features an integrated seat collar, improved aerodynamics and direct mount brakes. Mounting the rear brake under the new larger asymmetric chainstays gives improved brake performance whilst also allowing the seat stays to be shaped for maximum comfort whilst the stiff chainstays and bb provide the power. Fork: Carbon-Fork F8 Calip-DM, Monocoque Design, Carbon shaft 1.1/8"-1.1/4"